Sandefer played halfback and defensive back on coach Joe Kerbel’s 1952 and 1954 state championship teams at Breckenridge. As a senior, he led the Buckaroos to a 20-7 win over Port Neches-Groves in the 3A title game. Earlier that season, they had manhandled eventual 4A state champion Abilene, 35-13. In the Buckaroos' split-T offense, Sandefer rushed for 1,062 yards, passed for 248, caught passes for 96 and scored 17 touchdowns. 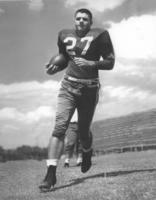 He earned all-district and all-state honors and was selected to play in the 1955 Greenbelt Bowl, where he was named the game’s outstanding back. Sandefer continued his winning ways at Oklahoma as a member of Sooner teams that pushed coach Bud Wilkinson’s historic win streak to 47 games. He was a member of the 1956 national championship team and the starting left halfback on the 1957-58 teams that won back-to-back Orange Bowls.